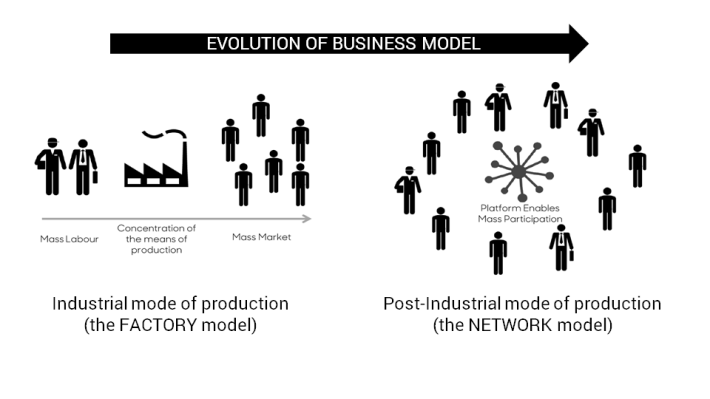 The first time I started thinking about developing a Toolkit to help platform designer it was in 2013: I was frustrated with using the Business Model Canvas, a tool that – in my opinion – was designed and optimized for an old way of doing businesses: a linear way, that of the industrial mode of production. The BM Canvas indeed implied a “linear” perspective where the business owner creates the value proposition and provides this it to the market, targeting one or many customer segments‘s appreciation. Already that time, a growing understanding – even in 2013 – was pointing out to how successful companies increasingly started to operate as hubs, developing the ability to “organize” skills, resources and inventories and, by doing so, redesign entire markets from scratch, with impressive results.